The Battle of Stamford Bridge was part of the invasions of Britain following the death of Edward the Confessor in 1066 and was fought September 25, 1066. Following the death of King Edward the Confessor in 1066, succession to the English throne fell into dispute. Accepting the crown from the English nobles, Harold Godwinson became king on January 5, 1066. This was immediately challenged by William of Normandy and Harald Hardrada of Norway. As both claimants began building invasion fleets, Harold assembled his army on the south coast with the hope that his northern nobles could repel Hardrada. In Normandy, William's fleet gathered, but was unable to depart St. Valéry sur Somme due to adverse winds. In early September, with supplies low and his troops' obligations expiring, Harold was forced to disband his army. Shortly thereafter, Hardrada's forces began landing at Tyne. Aided by Harold's brother, Tostig, Hardrada sacked Scarborough and sailed up the Ouse and Humber Rivers. Leaving his ships and part of his army at Riccall, Hardrada marched on York and met the Earls Edwin of Mercia and Morcar of Northumbria in battle at Gate Fulford on September 20. Defeating the English, Hardrada accepted the city's surrender and demanded hostages. The date for the surrender and hostage transfer was set for September 25 at Stamford Bridge, just east of York. To the south, Harold received news of the Viking landing and attacks. Racing north, he gathered a new army and arrived at Tadcaster on the 24th, after marching nearly 200 miles in four days. The next day, he advanced through York to Stamford Bridge. The English arrival caught the Vikings by surprise as Hardrada had expected Harold to stay in the south to confront William. As a result, his forces were not prepared for battle and much of their armor had been sent back to their ships. Approaching Stamford Bridge, Harold's army moved into position. Before the battle commenced, Harold offered his brother the title of earl of Northumbria if he would desert. Tostig then asked what Hardrada would receive if he withdrew. Harold's reply was that since Hardrada was a tall man he could have "seven feet of English earth." With neither side willing to yield, the English advanced and began the battle. The Viking outposts on the west bank of the River Derwent fought a rearguard action to allow the rest of the army to prepare. During this fight, legend refers to a single Viking berserker who single-handedly defended Stamford Bridge against all odds until stabbed from below the span by a long spear. Though overwhelmed, the rearguard provided Hardrada time to assemble his forces into a line. In addition, he dispatched a runner to summon the rest of his army, led by Eyestein Orre, from Riccall. Pushing across the bridge, Harold's army reformed and charged the Viking line. A prolonged melee ensued with Hardrada falling after being struck by an arrow. With Hardrada slain, Tostig continued the fight and was aided by Orre's reinforcements. As sunset approached, both Tostig and Orre were killed. Lacking a leader the Viking ranks began to waver, and they fled back to their ships. While exact casualties for the Battle of Stamford Bridge are not known, reports suggest that Harold's army suffered a large number of killed and wounded and that Hardrada's was nearly destroyed. Of the approximately 200 ships the Vikings arrived with, only around 25 were needed to return the survivors to Norway. While Harold had won a stunning victory in the north, the situation in the south was deteriorating as William began landing his forces in Sussex on September 28. Marching his men south, Harold's depleted army met William at the Battle of Hastings on October 14. 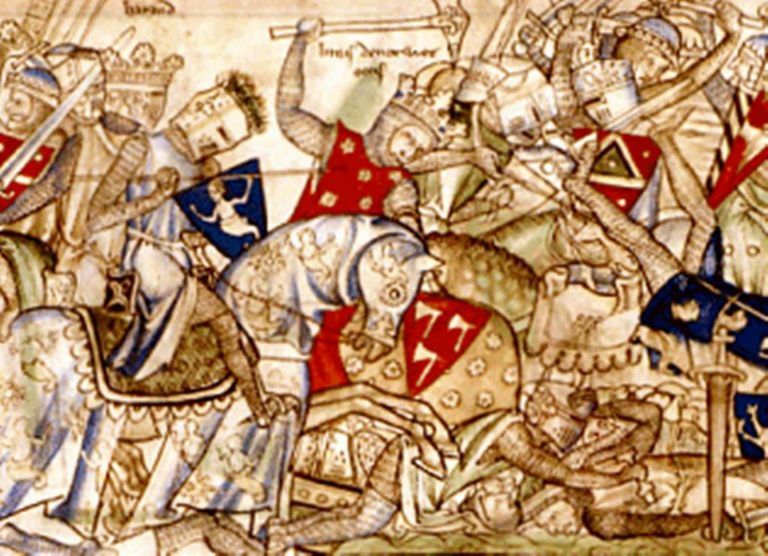 In the battle, Harold was killed and his army defeated, opening the way for the Norman conquest of England.